Jane Bozarth (@janebozarth) is a passionate advocate of Sharing Your Work and great teacher of the processes people can undertake to incorporate sharing into their daily work through her popular workshops and conference talks. Jane has a great blog at www.bozarthzone.com and has a great Pinterest board of examples of showing your work. Jane’s book on Show Your Work is a recommended read. 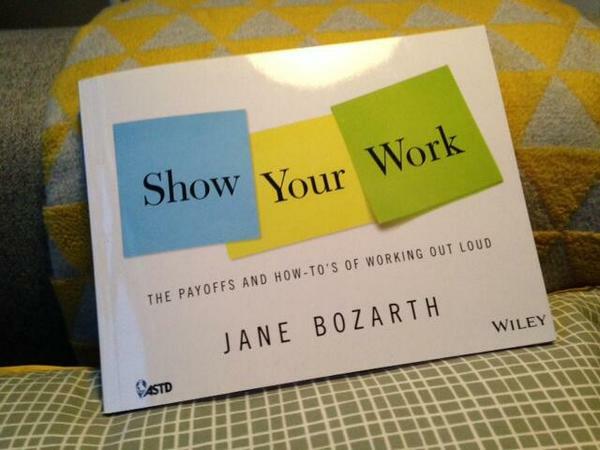 Jane shared with us how she came to discover the power of sharing work and working out loud. You have described how a friends experience of sharing cookie baking issues on Facebook led to the insight about Sharing Your Work. What was it about that process that appealed to you? Because it was so conversational. It was not someone setting out to “document their process” as we see so often in the workplace. It was just someone excited about sharing what she was learning talking about her experiences on Facebook. Others became interested, there was a lot of conversation and explicit shared learning, and eventually two of her friends launched their own cookie businesses. The way she shared her work was clearly more useful to others than a worker just turning in some weekly activity report. You talk about fitting sharing into your workflow. Can you give us examples of how people can tweak their work to get the benefits of sharing?Use processes that are in place: try to tweak things like existing reports to answer more about the “how I got that done” instead of just the “what I did”. I was the first person to ever drop screenshots into our weekly report. When you finish something, especially something that involved a lot of hard thinking-work, improvisation, or learning something new in order to execute it, just take a minute to reflect on it and make a note. Find the right tools for you: My whole life is built from my iPhone camera and Snagit’s sharing button. Others blog. Others talk about their cookies on Facebook. Show Your Work includes a couple of examples of quick note-taking templates: I encourage people to keep a stack of these handy and periodically stop to make quick notes. One thing I think is important, though: We’re not talking about sharing every breath you take. This doesn’t need to be a constant onerous task, and we’re not looking for just more noise. Pay attention to things you had to learn to do, or had to develop a solution for. The book has dozens and dozens of examples. One of the things most commented is a photo that emerged in an offhand Twitter conversation with a person who shared her approach to organizing her master’s thesis. Who or what inspires you to work out loud?I work for government and see so much redundancy and duplication of effort. As huge bureaucracies seem to be so inefficient at sharing knowledge, connecting talent pools, and communicating across silos, I’m hopeful that new tools and workers willing to use them will help drive some real improvement in that regard.